I just love mushrooms and whenever I see a punnet at the market or the vegetable shop, I have to pick it up. What to do with them, the idea comes later but buying mushrooms is a must! So this time its an open pie, very fast and a very satisfying meal.Serve it as a snack,or for dinner or lunch with some salad. Did you know that mushrooms are rich in Vitamin D? Well, yes they are.Like humans when exposed to the sun they produce Vitamin D.They are also a good source of the B Vitamins. Mushrooms are rich in selenium which helps to boost the immune system.Mushrooms can be eaten raw or cooked. To make the pesto sauce, put all the ingredients in a food processor and process till it becomes a paste. As I do not have a food processor, I first ground the pine nuts, garlic, parmesan and basil in a herb mill. Then I mixed in the olive oil and salt. It is difficult to make a small quantity in a liquidizer. To make the topping for the pie, heat oil in a wide pan. Saute the garlic for a few seconds. Add the zucchini and stir. Saute for 2 to 3 minutes. Add the mushrooms and saute for a further 2 minutes. Remove the pan from the heat. Let the mixture cool. When it is cool, add salt,dried herbs and pepper or chilli flakes and mix well. Cut the pastry into 10 parts.I used ready made pastry that is already cut into squares. You can decide on the size of each piece according to the pastry you use. Lightly grease a muffin tray with oil. Push the pastry down gently into the muffin tray. The best way to do it is to fold the pastry into half, pinch the two ends at the bottom half and then put the pastry into the muffin tray. Bake for 15 or until light golden in colour. Remove the tray from the oven. While the pastry is still hot fill it with the filling, pressing the filling down a bit to make an indentation. If you’re using cheese, sprinkle the cheese on top and put it in oven till the cheese melts. Serve hot with the pesto sauce and your favourite salad. A bit of the pesto sauce will be left. The above recipe yields 1 cup of sauce. Use the sauce for salads, sandwiches, pasta etc. it keeps well in the fridge for nearly a week.Top it up with extra olive oil and it will remain fresh. I have made this recipe using mushrooms only. You would need 4 cups of chopped mushrooms. Try mushrooms and ricotta cheese. Tastes great. If you love chilli food, add a green chilli while making the pesto sauce. 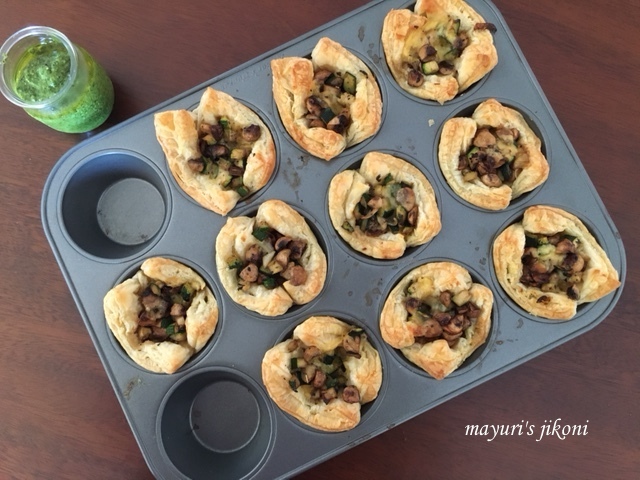 If the mushroom zucchini mixture becomes too cold, heat it up before you fill it in the pastry. I didn’t add extra cheese but you may do so. These sound delicious and would make a lovely appetizer for a party. These pies look so delicious and crispy. I love any snack made with puff pastry. Thanks Shazia. I like the small size as one can have a piece and not go overboard with them.